The Holy Trinity Monastery (Greek: Μονή Αγίας Τριάδος) (also known as Agia Triada, Ayías Triádhos, Ayia Triada; all meaning "Holy Trinity") is an Eastern Orthodox monastery in central Greece, situated in the Peneas Valley northeast of the town of Kalambaka. It is situated at the top of a rocky precipice over 400 metres high and forms part of 24 monasteries which were originally built at Meteora, one of the oldest still existing of the Meteora monasteries (Meteora means "suspended in the air" in Greek). Six of the 24 monasteries are still active and open to visitors. The church was constructed between the fourteenth and fifteenth centuries and is included in the UNESCO list of World Heritage Sites titled Meteora. The monasteries were built on rock cliffs in the deltaic plains of Meteora. The cliffs rise to a height of more than 400 metres (1,300 ft). They are situated in the Pineios Valley within the Thessalian plains close to the town of Kalambaka. The rock cliffs, dated by chemical analysis to be 60 million years old, were created during earthquakes, and are of sandstone and conglomerate formations caused by fluvial erosion. The sediments were once in an inland sea during the Pliocene epoch. They rose as a cone during the earthquakes, forming steep rock columns, known as "heavenly columns". The area is hilly and forested, with river valleys, and a protected area known as Trikala Aesthetic Forest. The monasteries of St. Stephen's and Holy Trinity are separated from the main group, which are further to the north. Prior to the twentieth century, Holy Trinity had a very difficult approach, requiring crossing a valley and climbing through the rock outcrop to reach the building's entrance. Provisions were placed in baskets drawn up by rope-ladders (now with a winch). In present day, one can walk from Kalambaka for 3 kilometres (1.9 mi) along a foot track to reach the monastery, or use a winch-operated lift. There is a road from the back side of the cliff. It is currently reached via tunnels and 130 steps of stone. The grounds include a 2 acres (0.81 ha) garden at the summit. The history of building monasteries on top of perilous cliffs near Meteora occurred between the 14th and 15th centuries. Even prior to this, in the 11th century, religious communities had established hermitages at the foot of these cliffs. In the 14th century, the titular emperor of Serbs and Greeks, John Uroš, became a monk and moved to Meteora; he endowed, rebuilt and established monasteries here. During the political upheavals in the region during this century, monks retreated to the safe haven offered by the cliffs. Dometius was said to be the first monk at the site of Holy Trinity, arriving according to local legend, in 1438. Holy Trinity according to many sources was built in 1475–76, though some sources say the construction dates of the monastery and its adjoining chapel, dedicated to St. John the Baptist, are unknown. Holy Trinity's decoration was added in 1741. By end of the fifteenth century, there were 24 such monasteries, such as Holy Trinity, St. Barbara Rousanou, and St. Nicholas Anapafsas. Damascene, Jonah, and Parthenios, were benefactors and those who took part in restorations; their names grace the monastery walls. Only six of the original monasteries are still occupied, including Holy Trinity. These six – Holy Trinity, St. Stephen, Rousanou, St. Nicholas Anapafsas, Varlaam, and the Great Meteoron – make up the UNESCO World Heritage Site entitled Meteora. The UNESCO inscribing was done under criteria in 1988. I, II, IV, V and VII. Left: Holy Trinity complex in Meteora. Right: Frescos inside the monastery. The church plan is in the form of a cruciform type and has a dome which is supported on two columns. The monastery’s main cathedral was constructed in the 15th century and decorated with frescoes in 1741 by two monks. A pseudo-trefoil window is part of the apse. There are white columns and arches, as well as rose-coloured tiles. A small skeuophylakion adjoining the church was built in 1684. Its broad esonarthex barrel vault was built in 1689 and embellished in 1692. The small chapel of St. John the Baptist, carved into the rock, contains frescoes from the seventeenth century. It was richly decorated and had precious manuscripts; however, these treasures were looted during World War II, when it was occupied by the Germans. The building's sixteenth-century frescoes are reported to be post-Byzantine paintings. A fresco of St Sisois and the skeleton of Alexander the Great adorns the walls. At one time, fifty monks lived at Holy Trinity, but by the early twentieth century, there were only five. Visitors are allowed. Patrick Leigh Fermor is reported to have visited the monasteries here several decades ago, as a guest of the Abbot of Varlaam. Even then, Holy Trinity was one of the poorest monasteries in Meteora. The monastery was featured in the 1981 James Bond film For Your Eyes Only. It features in the climax to the film where Bond ascends the rock cliff and intrudes upon Aristotle Kristatos and Erich Kriegler to retrieve the ATAC decoder. Aristotle Kristatos, played by Julian Glover, was using the monastery in the film as a hideout. Eventually Bond throws the ATAC decoder off the cliff top when approached by the KGB. The Monastery also features in the 1961 film Tintin and the Golden Fleece. ^ Hellander, Paul; Amstrong, Kate (1 March 2006). Greece 7th Edition. Lonely Planet. p. 268. ISBN 978-1-74059-750-0. Retrieved 24 December 2012. ^ a b "World Heritage List No. 455" (pdf). UNESCO. Retrieved 23 December 2012. ^ a b c "Meteora". UNESCO. Retrieved 23 December 2012. ^ Richardson, Rufus Byam (1907). Greece through the stereoscope (Public domain ed.). Underwood & Underwood. pp. 311–. Retrieved 23 December 2012. ^ a b c d "Agia Triada Monastery, Meteora". sacred-destinations.com. Retrieved 23 December 2012. ^ a b "Review of Ayiaz Triada". Frommers. Retrieved 23 December 2012. ^ a b c Hellander, Paul (30 March 2008). Lonely Planet: Greece. Lonely Planet. pp. 266–. ISBN 978-1-74104-656-4. Retrieved 23 December 2012. ^ a b c Fodor's Travel Publications, Inc. Staff (22 May 2012). Fodor's Greece, 10th Edition: With Great Cruises and the Best Island Getaways. Random House Digital, Inc. pp. 331–. ISBN 978-0-307-92916-7. Retrieved 23 December 2012. ^ Holmes, Burton (1919). Athens and Olympian games. Grecian journey. Thessaly (Public domain ed.). Travelogue bureau. pp. 295, 299–. Retrieved 23 December 2012. ^ Conder, Josiah (1830). Turkey. J. Duncan. p. 348. Retrieved 24 December 2012. ^ a b c Fermor, Patrick Leigh (12 October 2011). Roumeli: Travels in Northern Greece. New York Review of Books. pp. 100–. ISBN 978-1-59017-520-0. Retrieved 23 December 2012. ^ "Criteria". UNESCO. Retrieved 23 December 2012. ^ "Documents". UNESCO. Retrieved 23 December 2012. ^ Park, Tamara (19 November 2008). Sacred Encounters from Rome to Jerusalem. InterVarsity Press. pp. 1–. ISBN 978-0-8308-3623-9. Retrieved 23 December 2012. 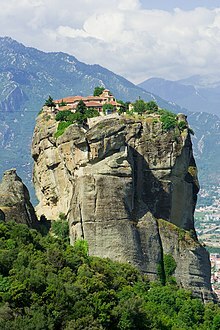 ^ Holy Trinity Monastery from Visit Meteora Travel. Retrieved 26 July 2013. ^ Clayton, Charles (30 October 2005). Round the Mulberry Bush. Lulu.com. pp. 28–. ISBN 978-1-4116-5396-2. Retrieved 23 December 2012. Wikimedia Commons has media related to Monastery of the Holy Trinity, Meteora. This page was last edited on 20 April 2019, at 21:20 (UTC).